When two hiking teens go missing around Lost River Lake, private investigator Maggie McKeown teams up with the local drunk to look for clues. 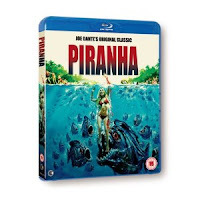 Their search takes them to a secret military base where they inadvertently let loose an experimental strain of mutant piranha. Now the guests at every resort downriver are on the menu! Producer Roger Corman, Director Joe Dante and Screenwriter John Sayles serve up one of the great gorefest cult classics of the 70's. View our full review here.